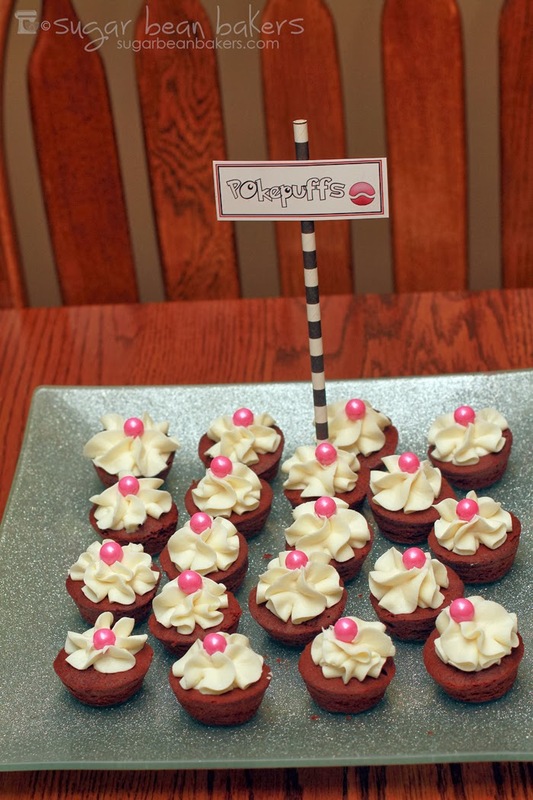 A couple weeks ago I hosted a surprise party for my niece's boyfriend. I told her it would be a super simple party. Cookies (he's not a big cake guy), games, and not much else. The night before the party, I changed my mind. He's (along with most of the others in attendance) a huge Pokemon fan. 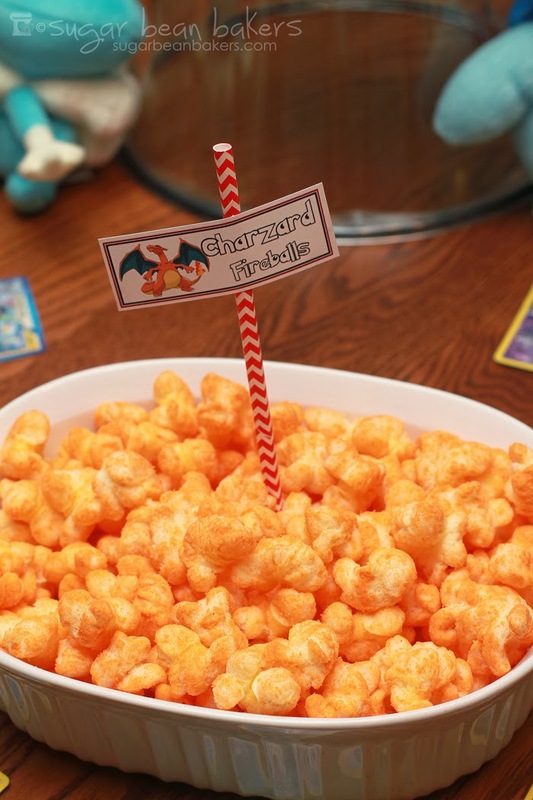 This party was a little harder for me since I know basically nothing about Pokemon. Bean has one (a Mew), that he lets me 'pet' and feed Pokepuffs to. That's my extent of Pokemon knowledge. So, he helped a LOT with this party. Again, this is nothing fancy, I gave myself a full 18 hours of 'no theme' to 'Pokemon themed'. Go me. Most of these treats are store bought for that reason. Like I said, this is a quick (but fun!) party. Pokemon eat treats called Pokepuffs. These could be homemade mini cupcakes, but since I had no time for that, I bought Little Debbie Brownie Bites, piped on canned Vanilla Icing, and topped with a large Sixlet. 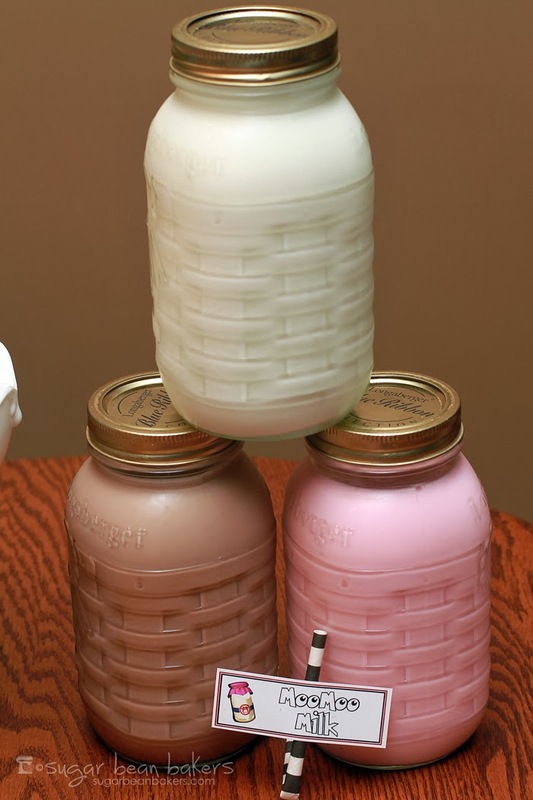 MooMoo Milk is milk from a Pokemon. It seemed like something I kinda had to have for a party, right? Slowpokes are a, to use Bean's exact word, derpy Pokemon. Things often bite a Slowpoke's tail, and they don't even notice for a full day. They are actually all pink, but I couldn't find just pink Twizzlers. These multi-colored ones were just too much fun. Bean pinched the ends off and formed them to look like tails. A Swirlix is a Pokemon that eats nothing but sweets. Because of this, it's fur is as sticky and sweet as cotton candy. This is the bagged cotton candy you can buy in the candy aisle. Charzards are a flying lizard. They spit fireballs. I planned to use cheeseballs, but, if you can believe this, I couldn't find any at the store! I used cheese puffcorn. I also thought about using the hot Cheetos. Squirtles are little, blue turtle creatures. They spit water at prey. 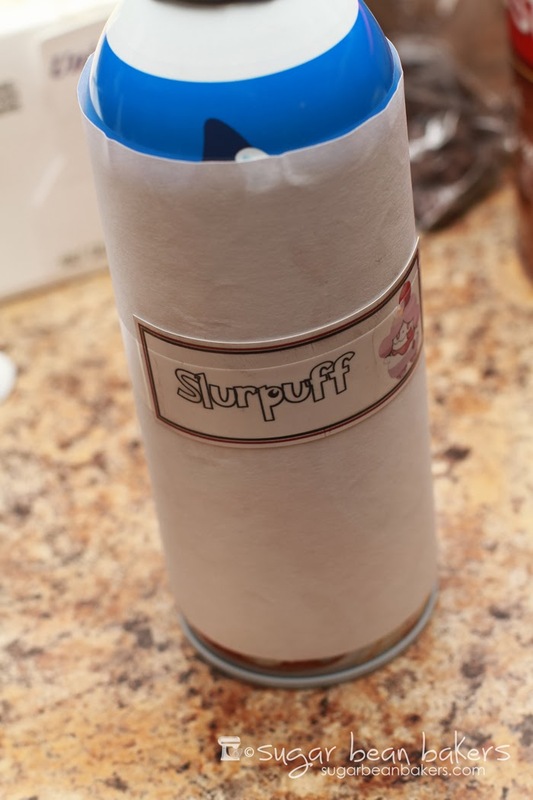 For this I used Blue Hawaiian punch. 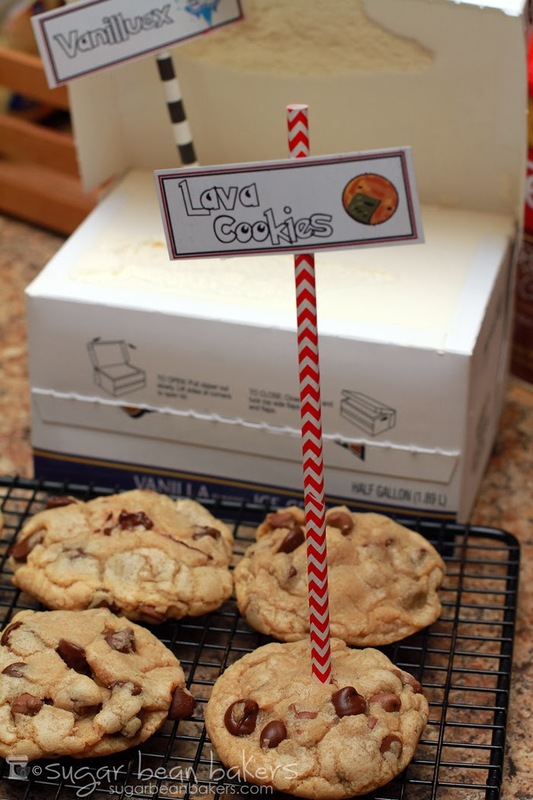 Lava Cookies are an item that can heal a Pokemon. Chocolate can heal too, so, same diff, right? 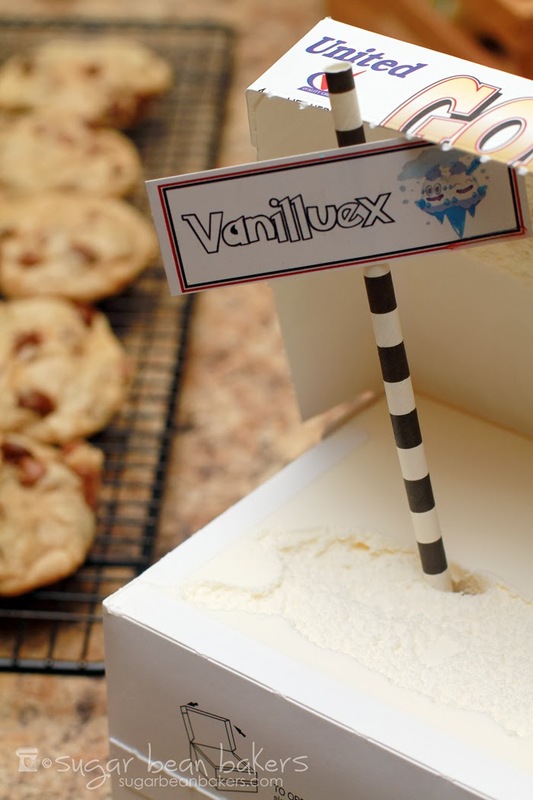 I paired the Lava Cookies with Vanilluex & made cookie sundaes with hot fudge sauce. Vanilluex is a Pokemon made of snow clouds. Basically, it's ice cream. I mean, look at it. 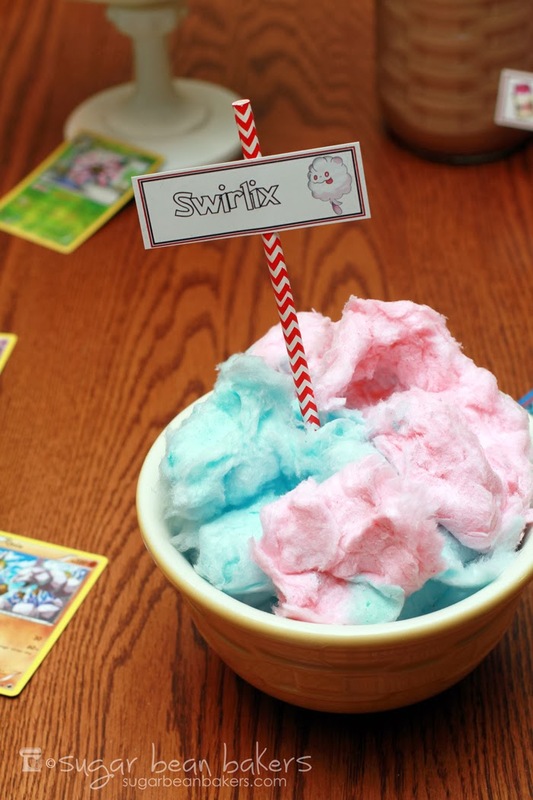 I topped the cookie sundaes with Slurpuff, which is a whipped cream like Pokemon. That was it for the food items! For the tags, I downloaded the Pokemon Hollow font for free at Dafont.com. I got most of the photos from Bulbapedia. 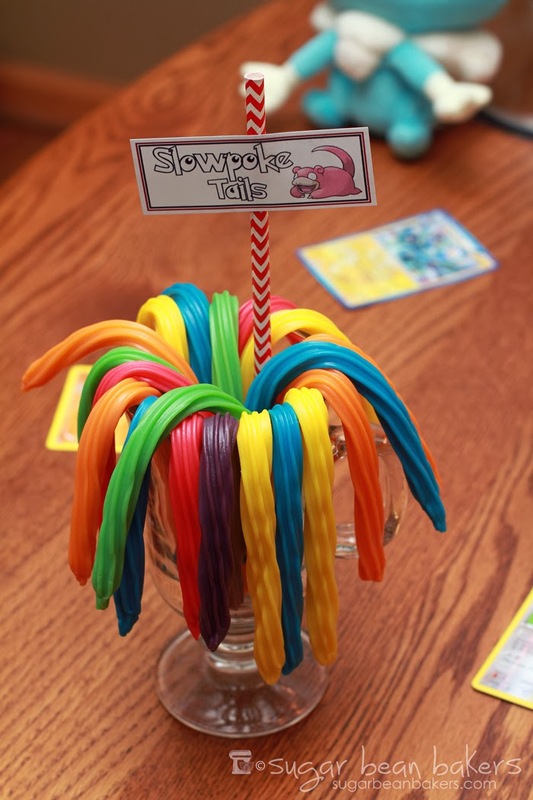 I attached the tags to stripy straws. 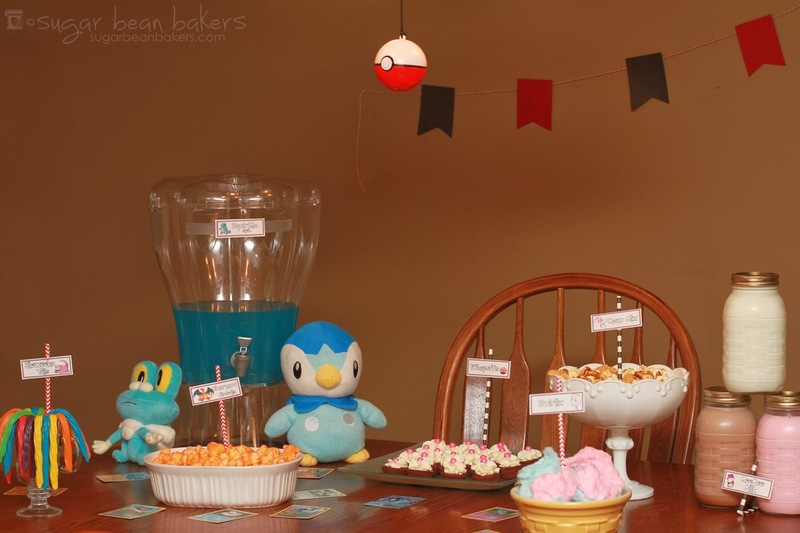 I made a little banner for behind the table in Pokeball colors and we hung a Pokeball from the light over the table. Then, Bean scattered some of his cards around the table. This could easily be taken up levels with tablecloths, napkins, and more banners. Mostly they played board/video games, but the one planned game I had involved clothes pins. This is taken from an old baby shower game. We wrote the names of Pokemon on the pins and everyone got a few when they arrived. Some were 'shiny' Pokemon, so worth 2 points. Throughout the night, whenever someone would say 'Pokemon' and another person caught them, they had to hand over one of their pins. At the end of the night, the person with the most pins was crowned Pokemaster and won a prize. So, there ya go. 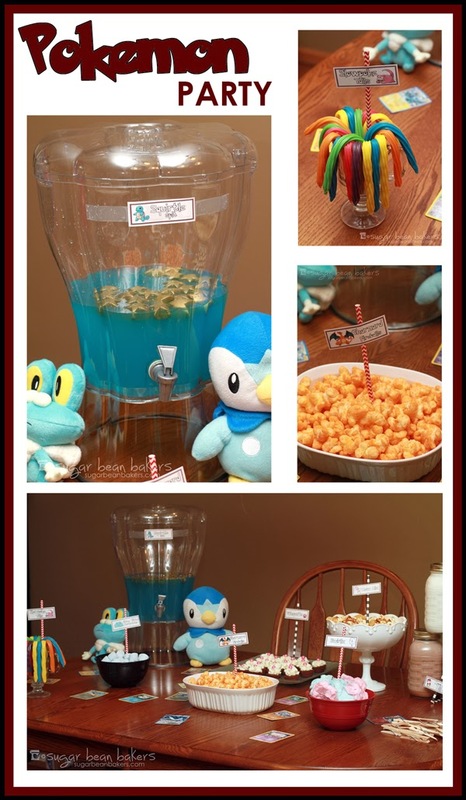 A quick, easy Pokemon Party which can easily be elevated! How fun! 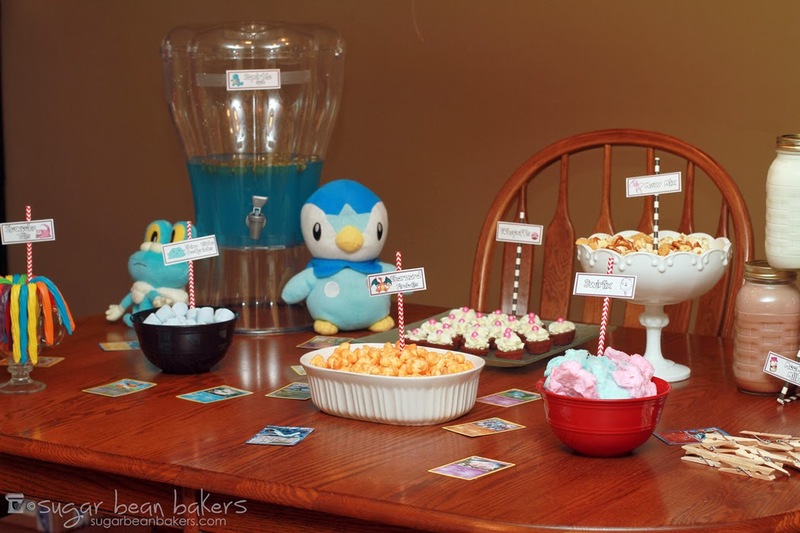 We had a Pokemon party a couple of years ago and my son loved it! 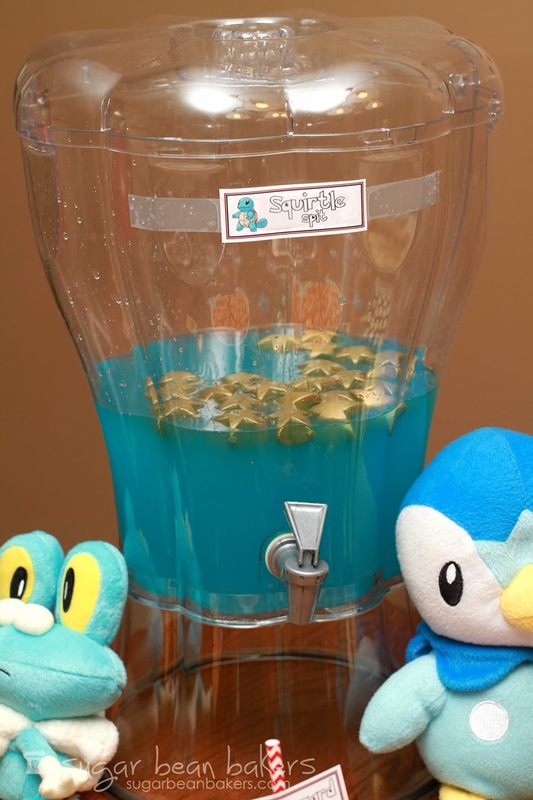 What are the gold floating stars in the squirtle spit?